The removal of the corner of the building that Mr. Ross is referencing occurred in 1946. The last of the early banks to occupy the building, The Union Trust Company, left for a new office in 1942. William Camlin, a local contractor and engineer purchased the building and rented it to the Sanitary Meat Market. 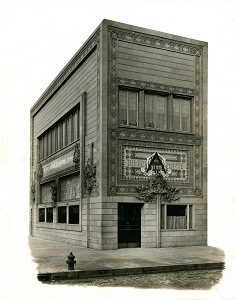 It was at the time of the transition between the meat market and new tenant, Symons Best Jewelry Company, that the front entrance was changed by cutting away the southeast corner of the building to create a new diagonal entrance flanked by small display windows. An iron pole was installed at the corner to support the building. Additional changes at this time include removal of all bank fixtures, construction of a drop ceiling covering the intricate geometric murals of the banking floor, and enlarging of the south facing windows. Louis Sullivan’s design philosophy throughout his career was to create an indigenous American architecture, imposing a uniformity “forcing the functions of every sort of building into one general form, adopting an outward shape for the sake of the eye or association.” It is our intention to fully restore the exterior of Louis Sullivan’s Newark “jewel box” to its original 1914 design, rebuilding the southeast corner of the building, reestablishing the original Third St. entryway and restoring the windows to correct the south elevation fenestration to its original design. At the conclusion of the restoration, The Louis Sullivan Building of Newark will once again be the democratic, dignified form originally envisioned by Sullivan.